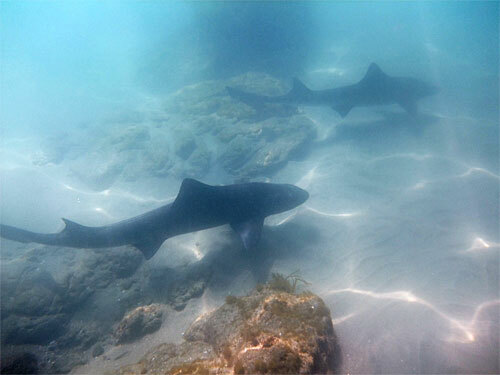 Snorkeling La Jolla Shores would be pointless were it not for the beautiful Leopard Sharks that congregate there to raise their young in the summers. Other than sand and a few rays, the sharks are pretty much it. 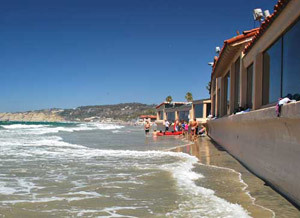 La Jolla Shores is located right down the road from La Jolla Cove. The shores area is a very popular beach hangout. It has to be one of the nicer sunning and swimming beaches on the west coast. But what most people who go there don't know is that in the summer, on the south end of the beach, in front of the tennis club/Marine Room Restaurant area, the wonderfully beautiful Leopard Sharks hang out in the hundreds in about four to five feet of water. 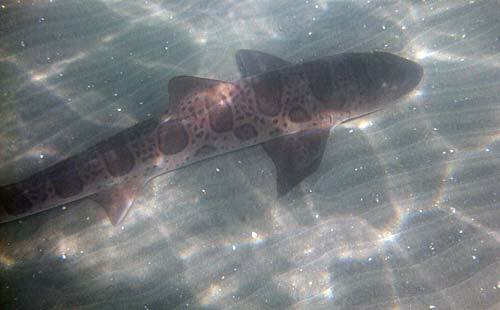 You should not be afraid of snorkeling with Leopard Sharks. They are small, harmless sharks that reach a maximum of 4.9 feet long. They live mostly in California, Oregon and Mexico. They pretty much cannot harm you, only having mouths big enough to feed on clams, crabs and fish eggs. Look at the picture below (from Wikipedia Commons). You can see how small their mouths are. You won't see them swimming with the kelp like this at the shores. They are very graceful swimmers and have unique spotted markings that make them very interesting to see. 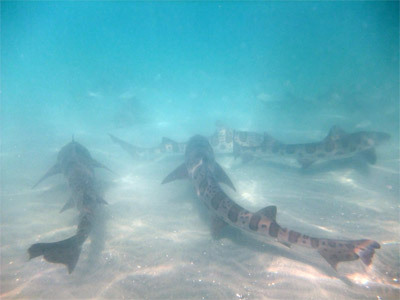 Learn more about snorkeling with Leopard Sharks here. Snorkeling La Jolla Shores - A Guided Tour? We did not take a guided snorkel tour to view the Leopard Sharks. As experienced snorkelers we decided to do it ourselves. But if you are more comfortable in groups, inexperienced, or want to learn more about these beautiful creatures, consider booking a tour. 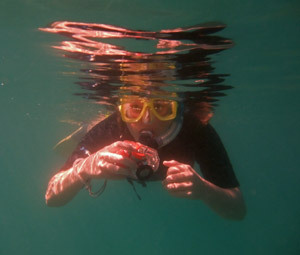 Another upside of a guided snorkeling La Jolla Shores tour is they usually include your snorkel gear and wetsuit. 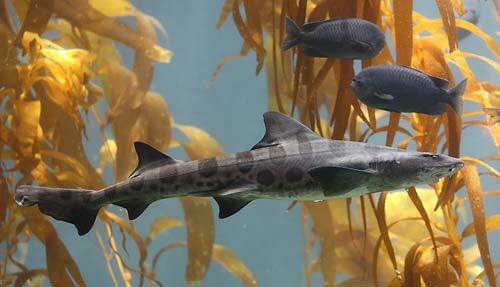 Where Are The Leopard Sharks? La Jolla Shores is at Kellogg Park. 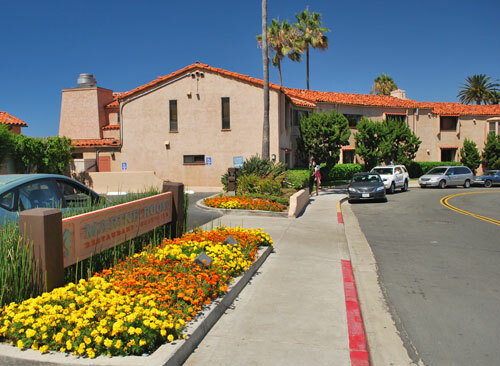 You can park your car at Kellogg Park or in the neighborhood nearby, and walk down the beach to the south to the area in front of the tennis club/Marine Room Restaurant. The sharks are normally in the area in front of the Marine Room Restaurant. The nice thing about doing it this way is that after you get out of the water you can use the fresh water showers and restrooms at the park. But the parking is normally a bit difficult. 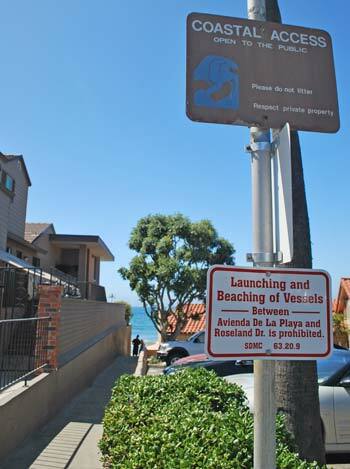 For easier parking, and more direct access to the snorkeling spot, there is a small alley type access point to the beach right beside the Marine Room Restaurant. This will lead you directly out to where you want to enter the water. The sharks are most often straight out from the restaurant. The problem sometimes with this access point is if there is a high tide there is no beach available (it comes right up to the buildings - see picture above right). 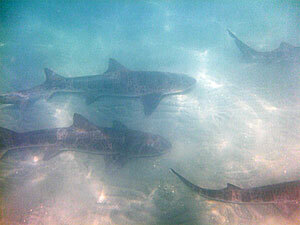 When snorkeling La Jolla Shores we have found the sharks tend to stick to a fairly shallow area. So if you swim too far out, and it gets deeper, you will probably not find them. So swim out until you are in about four to five feet of depth, and swim from left and right along that depth until you find them. Sometimes the visibility is a bit low if there are waves. We found the sharks were easiest to see just where the visibility was starting to improve in slightly deeper water. We saw a baby ray (picture at right). And that is something you should show a little caution with when entering and leaving the water. 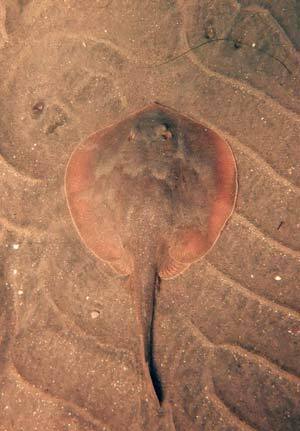 We recommend that you shuffle your feet as you walk in and out to avoid stepping on a ray in the sand. 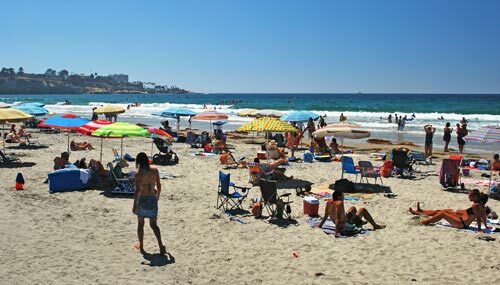 When snorkeling La Jolla Shores you will be in shallow waters over sand, and the water is fairly warm because of this. If you are thick skinned you may do fine without a wet suit. We enjoyed having our shorty wet suits though. There are lifeguards here which makes things a little safer. But you will be at the far end of the beach so be aware they may not see you if you are in distress. Take Prospect Place to Torrey Pines Road and turn left. Then take a left on Princess Street. Follow it to the right as it turns into Spindrift Drive. Look for the Marine Room Restaurant, right before Spindrift Drive turns into Paseo Dorado. Park on the street and take the little alley to the beach that is on the left side of the Marine Room Restaurant parking lot. Or if you want to park at Kellogg Park, continue down the road and then take a left at Calle de la Plata. Take your next left on Avenida de la Playa and right on Camino del Oro. The park is on the left. Park where you can on the street in the nearby neighborhood. Below is a picture of the front of the Marine Room parking lot. And the next picture is the little alley you will be looking for on the left side. Take the La Jolla Pkwy exit (26A). It will turn into Torrey Pines Road. Turn right on Calle de la Plata. If you want to go to Kellogg Park, follow it to Avenida de la Playa and take a left, then a right on Camino del Oro, the park will be on your left. Or to go to the closer beach access, take a left on Paseo Dorada from Calle de la Plata, and at the corner where it turns into Spindrift Drive, park on the street and take the little alley to the beach that is on the left side of the Marine Room Restaurant parking lot. Take the La Jolla Village Dr exit (28). Turn right from the exit. Turn left onto Torrey Pines Road. Stay right at the intersection with La Jolla Pkwy. 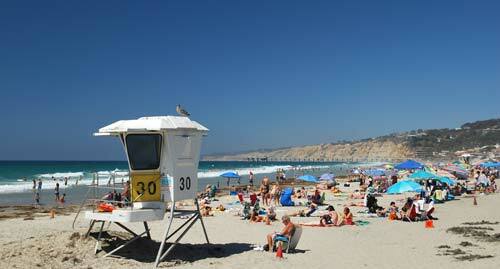 We would love to hear about your experience and advice about snorkeling La Jolla shores here.